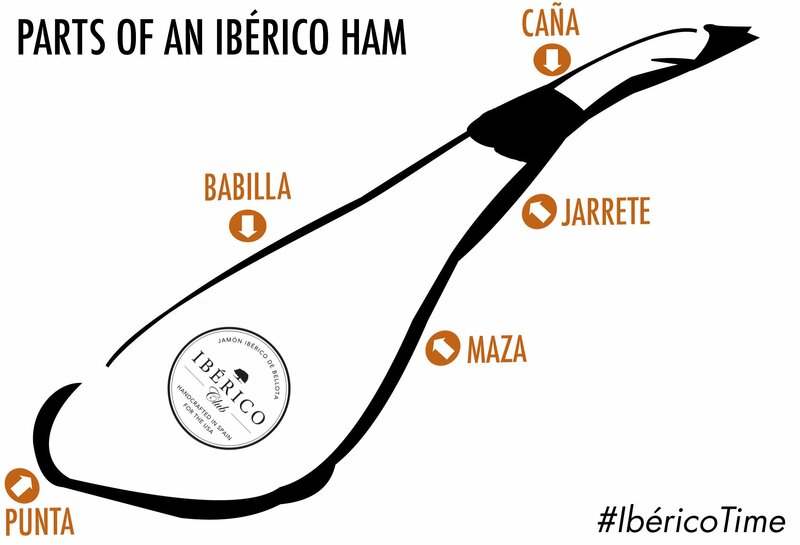 The different parts of an Acorn-fed Ibérico ham (Jamón Ibérico de Bellota) provide different degrees of curation and different aromas, textures and flavors. Maza: It has a great deal of meat and intramuscular fat. It is regarded as the richest part since the juiciest, most succulent, marbled and tender slices of meat are taken from this part. Babilla or Contramaza: This part is behind the “maza”. It is quite narrow and has less meat. It is not as juicy because it is covered with less fat. It is confined by the femur and hip bone. Caña: The closest part to the hoof. Jarrete: Located between the “caña” and the “maza”. The meat form this part is not as tender as the babilla, and offers complex and concentrated flavors. It can also be sliced into cubes of ham as the meat has a firmer texture. Punta: This is one of the juiciest parts of the ham. It has a higher fat to meat ratio, and is really tasty due to the marbling of fat into the muscle. It is at the opposite extreme to the hoof. Needless to say that every part of a Jamón Ibérico de Bellota, commonly called Pata Negra is absolutely delicious. Enjoy and remember to visit us to get the tastiest cured meat in the world, Jamón Ibérico de Bellota.